Recently, some Salem ophthalmologists have taken an in-depth look at the causes and treatment of glaucoma. In this post, we will discuss the different treatments for glaucoma that range from eye drops to lasers to more extensive surgical options. The goal of glaucoma therapy is to reduce the advancement of optic nerve damage by using the most efficacious treatment with the least amount of side effects. Our choice of how to treat a patient’s glaucoma depends on the severity of glaucoma and the desired effect. In some cases, treatment with eye drops is all that is necessary. However, we also have options that include the use of a laser or treat the area with a minimally invasive glaucoma procedure at the time of cataract surgery. Selective Laser Trabeculopasty, also called “SLT,” is a technique that utilizes focused laser energy that is applied to the outflow screen, known as the trabecular meshwork. This laser energy stimulates the trabecular meshwork to open so the intraocular fluid can more readily exit the eye without damaging the surrounding tissue. Eyes that have a good response to the initial treatment can have the laser repeated if the effect is lost over time. Studies have found that the majority of eyes treated with SLT will experience a significant reduction in eye pressure lasting up to 3-5 years. SLT can be used as an initial treatment or in addition to topical medications when it is determined that lower pressure is needed. Furthermore, topical glaucoma drops can be irritating to the ocular surface, exacerbating dry eye symptoms. The SLT laser can improve the quality of life in patients who cannot tolerate using topical glaucoma drops. This treatment can save on the cost of chronic medications as well as reduce the time and hassle of frequent drop applications. Finally, there are surgical options to treat the early and more advanced stages of glaucoma. In the early stages, the pressure can be treated at the same time as cataract surgery in two different ways: first, by using a laser called an “Argon” to reduce the amount of fluid being produced, and secondly, by placing a small shunt in the trabecular meshwork that helps improve fluid outflow. In more advanced cases of glaucoma, more invasive surgeries are required to further reduce eye pressure. These advanced procedures all share similar characteristics and goals which are to create a reservoir outside of the eye for intra-ocular fluid to go in order to greatly reduce the eye pressure. Each different approach has its advantages and disadvantages. 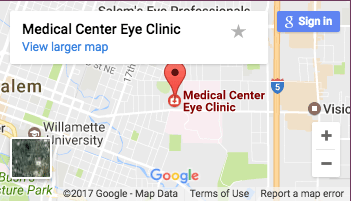 The goal of our Salem ophthalmologists at the Medical Center Eye Clinic is to partner with you in order to provide the most appropriate treatment with the greatest benefit and least amount of side effects. Speak with one of our Salem ophthalmologists to find out more information. – John G. Dodd, D.O. Hi, my name is Karl and I’m a new patient here. I wanted to familiarize myself with the web site and see if you have a patient portal. This is the first eye exam that I’ve ever had in my 52 years of living. Anyway, I don’t want to waste any more of your precise time, I know your patients are important. I look forward to meeting you and your entire staff tomorrow morning. Again, Thank You, and have a great day.